Thousands of people have cheered on veterans of the Second World War today as events took place to mark the 70th anniversary of VJ Day. A Service of Commemoration was held at St Martin-in-the-Fields to mark VJ Day 70, organised by the National Far East Prisoner of War Fellowship Welfare Remembrance Association, and attended by The Queen, The Duke of Edinburgh, The Earl and Countess of Wessex, The Duke and Duchess of Gloucester, the Prime Minister, veterans and their families. 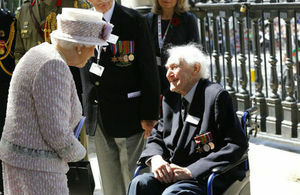 Earlier today, Her Majesty The Queen, members of The Royal Family and the Prime Minister attended a moving service of Remembrance along with veterans, former Prisoners of War and Civilian Internees at St Martin-in-the-Fields Church, Trafalgar Square, organised by the National Far East Prisoners of War (FEPOW) Fellowship Remembrance Association. During the service, a wreath was laid by Lieutenant Colonel Slater of the Royal Anglian Regiment Association, at the church’s memorial to Far East Prisoners of War, which includes an original section of the notorious Burma-Siam Railway. Candles for peace and Remembrance were lit at the altar by Charlotte Pash and Jack Blatt, great-grandchildren of FEPOW veterans. We are remembering this anniversary today because of the thousands of people who died, suffered appalling injuries and were tortured during this conflict. It is right that we remember, it is right that we thank them and it is right that we recognise that they suffered for our freedoms. This afternoon, Their Royal Highnesses The Prince of Wales and The Duchess of Cornwall and the Prime Minister joined hundreds of veterans and their families, along with current members of the Armed Forces for a special commemorative event hosted by Her Majesty’s Government and The Royal British Legion on Horse Guards Parade. The event began with a spectacular flypast of current and historic aircraft including a Dakota and Hurricane of the RAF Battle of Britain Memorial Flight and a current RAF Typhoon. 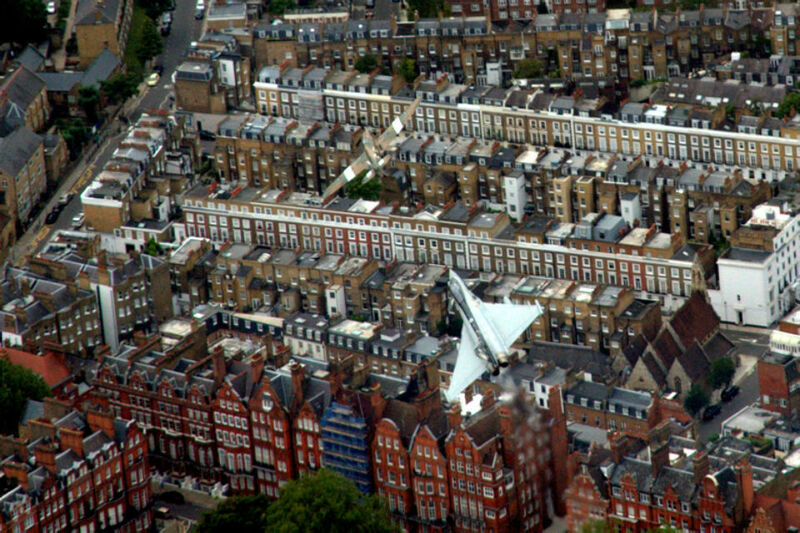 Air-to-Air image of a Hurricane and Typhoon aircraft flying over London for VJ Day 70th. Nearly 2,000 people including veterans, family members, widows and descendants attended the service. They were joined by senior political and military representatives. The 70th anniversary of VJ Day has brought the UK together to pay tribute to the courage of veterans, civilian internees and Prisoners of War who fought and suffered for their country. It is only right that we recognise the sacrifices made by all those whose actions led to the final victory of Allied Forces in the Second World War and ensured the security at home that we now all enjoy. Wreaths were laid at the service by The Prince of Wales on behalf of the nation, the Prime Minister on behalf of Her Majesty’s Government and the National Chairman of The Royal British Legion John Crisford with John Giddings, Chairman of the Burma Star Association, on behalf of the veterans. Famed actor Charles Dance read the poem ‘Mandalay’ by Rudyard Kipling, set to music specially composed by David Cole MVO, Director of Music, The Royal British Legion. The poem was famously turned into a song in the early 20th century and was a favourite marching tune for many who served in the 14th Army in Burma. I would like to add my own, and my family’s, warmest wishes and admiration for all the veterans and their families gathered in commemoration. Colour Sergeant John Naylor, 40, from Suffolk, is a soldier serving with 1st Battalion The Royal Anglian Regiment. His great-uncle escaped an attack on an Army hospital in Singapore and became a Prisoner of War. John took part in a reading at the service on Horse Guards Parade, alongside veteran John Riggs, 95, from Kent, who served with the Bedfordshire and Hertfordshire Regiment, a unit which eventually became part of the Royal Anglian Regiment. The anniversary of VJ Day is very personal for me and it is something we must remember as a nation. It was great to see so many members of the public turn out to support the veterans and all those who were affected in some way by the war in the Far East. 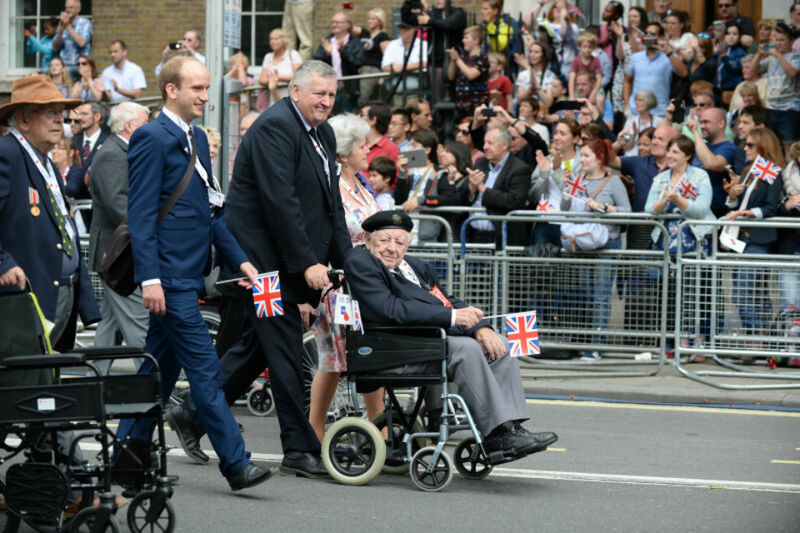 Thousands of people cheered on veterans of the Second World War today as events took place in London to mark the 70th anniversary of VJ Day. Afterwards, veterans, Civilian Internees, their descendants and families proudly marched along Whitehall to Westminster Abbey, cheered on by spectators lining the route. For the final part of the parade route, they were flanked by serving members of the Armed Forces. A reception for the veterans and their families was then held in the grounds of Westminster Abbey, hosted by the Royal British Legion and attended by Their Royal Highnesses The Prince of Wales and The Duchess of Cornwall and the Prime Minister. For more information about the day, visit www.gov.uk/vjday70.